…and thanks for coming! 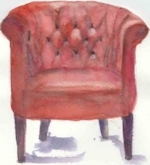 Take a seat in the red chair (um..you might have to clear it first)…and stay awhile. I love the arts in its many forms and I love to share what I have found, mined, or created with you. I blog about the arts and similar jewels of life. Subscribe to the mailing list and get notified when there is a new post. (I post once or twice a week usually.) Coming in 2019, some freebies for subscribers. A little trip to the index (the three lines at the top left) will take you to a collection of goodies elsewhere at this site. I am a mixed media artist who loves to make art with watercolor, acrylic, pen and ink, collage, and to carve my own images. I keep a visual journal and/or sketchbook, adding something every day. Each year I create a calendar (or two!) for purchase at the shop.